The Soviet Union stunned the world on Nov. 3, 1957, with the launch of Sputnik 2. On board the small satellite was a little dog, Laika, the first animal to orbit Earth. However, Laika was not the first animal in space. The United States and the U.S.S.R. had been putting animals atop rockets since 1947. In the early days of rocket science, no one knew what the effects of weightlessness would be. Animals — mainly dogs, monkeys and chimps — were used to test the safety and feasibility of launching a living being into space and bringing it back unharmed. Since then, animals have continued to play an important role in understanding the impact of microgravity on many biological functions. Astronauts have studied all kinds of animals — wasps, beetles, tortoises, flies, worms, fish, spiders, rabbits, bees, ants, frogs, mice, crickets, rats, newts, snails, urchins, moths, brine shrimp, jellyfish, guinea pigs, butterflies, scorpions and cockroaches. Laika was a young, mostly-Siberian husky. She was rescued from the streets of Moscow. Soviet scientists assumed that a stray dog would have already learned to endure harsh conditions of hunger and cold temperatures. Laika and two other dogs were trained for space travel by being kept in small cages and learning to eat a nutritious gel that would be their food in space. The dog’s name was originally Kudryavka, or Little Curly, but she became known internationally as Laika, a Russian word for several breeds of dog similar to a husky. American reporters dubbed her Muttnik as a pun on Sputnik. Unfortunately, Laika’s trip into space was one-way only. A re-entry strategy could not be worked out in time for the launch. It is unknown exactly how long Laika lived in orbit — perhaps a few hours or a few days — until the power to her life-support system gave out. Sputnik 2 burned up in the upper atmosphere in April 1958. Although there is no distinct boundary between the atmosphere and space, an imaginary line about 68 miles (110 kilometers) from the surface, called the Karman line, is usually where scientists say Earth’s atmosphere meets outer space. The first animals to reach space — not counting any bacteria that may have hitched a ride on previous rockets — were fruit flies. On Feb. 20, 1947, the United States put fruit flies aboard captured German V-2 rockets to study radiation exposure at high altitudes. In 3 minutes and 10 seconds, the fruit flies reached a distance of 68 miles. The first mammal in space was Albert II, a Rhesus monkey. Albert I’s mission had been unsuccessful, but the second Albert reached a distance of 83 miles on June 14, 1949. Albert was anesthetized during flight and implanted with sensors to measure his vital signs. Unfortunately, Albert II died upon impact at re-entry. While the United States was experimenting with monkeys, the Soviet Union was experimenting with dogs. During the 1950s and 1960s, the Soviet Union had slots for at least 57 dogs. However, because some dogs flew more than once, fewer than 57 actually participated. 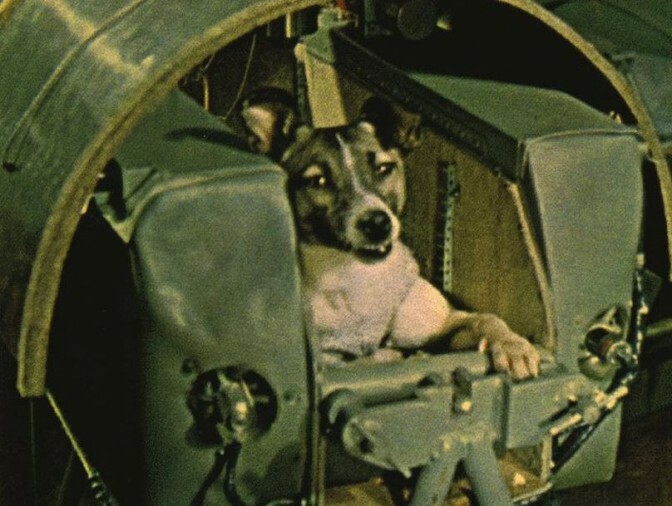 The first dogs launched, Tsygan and Dezik, were aboard the R-1 IIIA-1. The dogs reached space on July 22, 1951, but did not orbit. They were the first mammals successfully recovered from spaceflight. After Laika, the Soviet Union sent two more dogs, Belka and Strelka, into space on Aug. 19, 1960. The animals were the first to actually orbit and return alive. Ham the chimpanzee after his successful suborbital spaceflight of Jan. 31, 1961. Gordo, a squirrel monkey, launched 600 miles high on Dec. 13, 1958. He died on splashdown when a flotation device failed. Able, a Rhesus monkey, and Baker, a squirrel monkey, were launched together on May 28, 1959. They flew 300 miles high and returned unharmed. However, Able died during an operation to remove an electrode from under her skin. Baker lived until 1984, dying of kidney failure at age 27. Ham, a chimpanzee trained to perform tasks during spaceflight. Ham, named after the Holloman Aerospace Medical Center, became a celebrity after his flight on Jan. 31, 1961. Ham learned to pull levers to receive banana pellets and avoid electric shocks. He successfully became the first animal to actually interact with a space vessel rather than simply ride in it. On Oct. 18, 1963, French scientists launched the first cat into space. Felix was successfully retrieved after a parachute descent. Two Russian dogs, Veterok and Ugolyok were launched into space on Feb. 22, 1966. They orbited for a record-breaking 22 days. Humans did not surpass the record until 1974. Although the early animal astronauts achieved great fame, many other animals have quietly contributed to the body of scientific knowledge about life in space. As humans have grown more accustomed to space travel, fewer animals make the front-page news. Still, their contribution are important. Some animals have been sent up as part of experiments designed by students, others by NASA and other countries. By 2004, the space shuttle program had flown over two dozen SpaceLab experimental packages. Nearly all of the experiments were designed with one main purpose in mind: to study the effects of microgravity on the biological functions of earth creatures. Some of the biological functions that have been studied are (to name just a few): brain states, behavioral performance, cardiovascular status, fluid and electrolyte balance, metabolic state, tissue development, and mating in zero gravity. Nov. 9, 1970: Two bullfrogs were launched on a one-way mission to learn more about space motion sickness. Some water bears eat microscopic animals, while others consume algae. July 28, 1973: Two garden spiders named Arabella and Anita were used to study how orbiting earth would impact spiders’ ability to spin webs. Arabella spun a fairly symmetric web even though the thread thickness varied — something that earthbound spiders don’t experience. July 10, 1985: Ten newts flew on board the Bion 7. Their front limbs were amputated in order to study regeneration in space to better understand how humans might recover from space injuries. April 17, 1998: More than 2,000 creatures joined in 16 days of neurological testing alongside the seven-member human crew of the shuttle Columbia. September 2007: Microscopic creatures commonly known as water bears (tardigrades) survived a 10-day exposure to open space. The creatures are known to have the ability to withstand extreme conditions, including dehydration, and still recover and reproduce. The animals were dried out and re-hydrated after surviving cosmic rays, a near vacuum, and freezing temperatures. It was a Space Race victory that would have broken Sarah McLachlan’s heart. 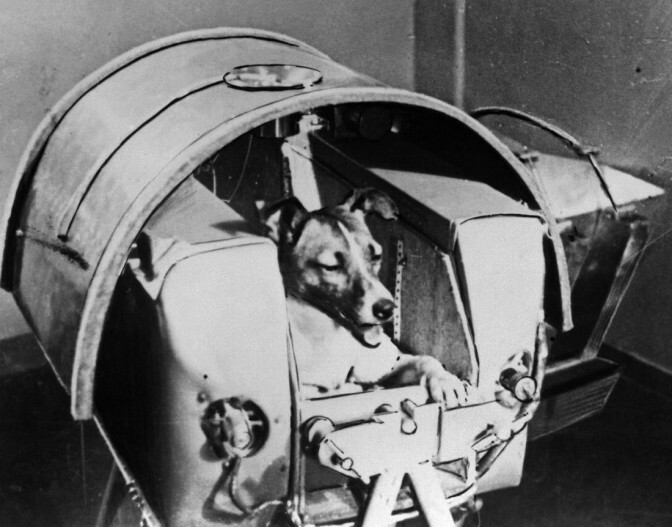 On this day, Nov. 3, in 1957, the Soviet Union launched the first-ever living animal into orbit: a dog named Laika. The flight was meant to test the safety of space travel for humans, but it was a guaranteed suicide mission for the dog, since technology hadn’t advanced as far as the return trip. Laika was a stray, picked up from the Moscow streets just over a week before the rocket was set to launch. She was promoted to cosmonaut based partly on her size (small) and demeanor (calm), according to the Associated Press. All of the 36 dogs the Soviets sent into space — before Yuri Gagarin became the first human to orbit Earth — were strays, chosen for their scrappiness. (Other dogs had gone into space before Laika, but only for sub-orbital launches.) The mission was another in a series of coups for the Soviet Union, which was then leading the way in space exploration while the United States lagged. Just a month earlier, they had launched Sputnik, the world’s first satellite. When Laika’s vessel, Sputnik 2, shot into orbit, the U.S. fell even further behind. “The Chicago American noted: ‘The Russian sputpup isn’t the first dog in the sky. That honor belongs to the dog star. But we’re getting too Sirius,’” the piece adds. Other headline-writers treated Laika with more compassion. According to another story in the same issue, the Brits were especially full of feeling for the dog — and outrage toward the Russians. “THE DOG WILL DIE, WE CAN’T SAVE IT, wailed London’s mass-minded Daily Mirror,” the story declares. The Soviet embassy in London was forced to switch from celebration mode to damage control. Nearly a half-century later, Russian officials found themselves handling PR fallout once again after it was revealed that reports of Laika’s humane death were greatly exaggerated. Although they had long insisted that Laika expired painlessly after about a week in orbit, an official with Moscow’s Institute for Biological Problems leaked the true story in 2002: She died within hours of takeoff from panic and overheating, according to the BBC. Sputnik 2 continued to orbit the Earth for five months, then burned up when it reentered the atmosphere in April 1958. One of Laika’s human counterparts in the Soviet space program recalled her as a good dog. He even brought her home to play with his children before she began her space odyssey.